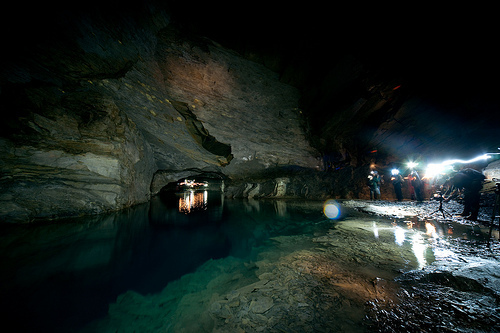 This was a trip organised on Adit Now - many thanks to Simon for being such a good guide :) This mine is very securely gated - it's not possible to get in unescorted. 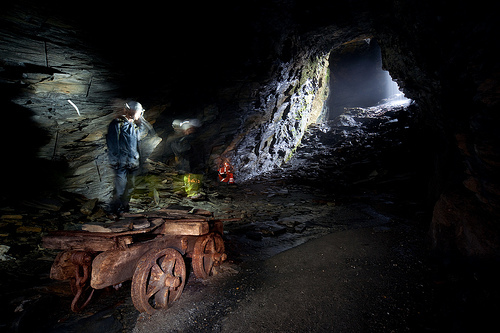 Rhiwbach slate mine is built on the other side of the mountain to Blaenau Ffestiniog - the Penmachno valley doesn't have any good transport links, so unusually the slate from Rhiwbach and nearby mines has to first go up to the top of the mountain then down the other side to the narrow-gauge railway at Blaenau. 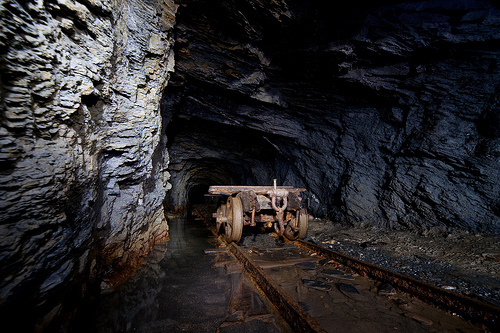 For significant periods of Rhiwbach's life, it made more money from transporting other companies' slate on it's inclines than it made from it's own slate. We entered through the half-mile-long drainage tunnel - built by hand, it's dead straight and very accurately sloped at 1-in-1000 - an impressive feat. One slab truck still sits on the tracks. 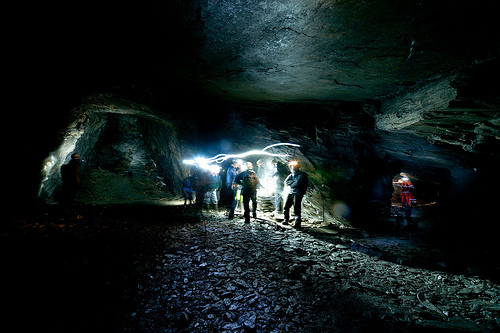 The galleries are truly impressive - more so when you realise that they were dug mostly by hand, by candlelight. For much of the quarry's life, holes for gunpowder were drilled by hand using a tool called a jumper - simply a steel rod about 6' long with a sharp end. This was simply walloped into the rock - wallop, half turn, wallop, half turn, repeat for an 8-hour shift, and you had one hole. These guys worked hard! 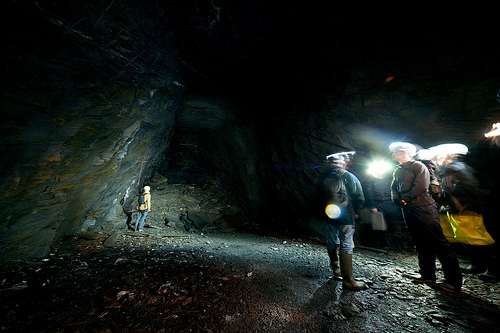 Then, once you had a series of holes, you packed gunpowder into the holes using a copper tamper rod which wouldn't produce sparks - in dim candlelight it sometimes happened that a miner mixed up the tamper and the jumper, with sometimes fatal consequences. 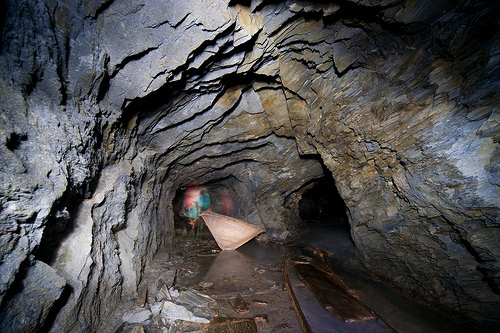 A little further along, one of the lower galleries is completely flooded - it can be crossed by inflatable rowboat. The roof in this area is quite delicate, so silence is a good idea. 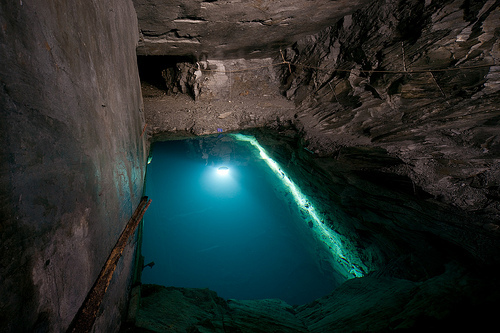 A little further on, our route goes past this deep sink - the ledge on the left does have a rope to hold on to. Up on the next level, and another gallery - this is the height of the sink we were standing over on the level below. 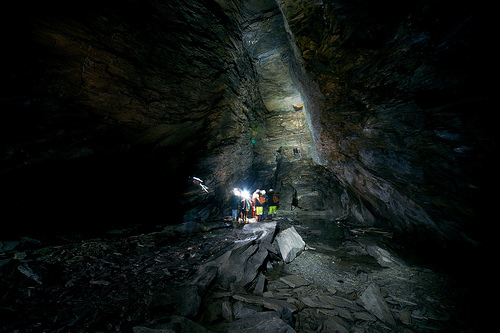 You also get an idea of how brave these miners were - they worked on these rockfaces by candlelight, with at most a piece of hanging rope or chain to wrap around one leg as a safety backup. Just as daring were the surveyors who studied the quality of the rock - to cover large areas, they would climb on a giant free-standing ladder held up by four ropes - men below would pull the ropes to swing the surveyor from one side of the chamber to another, so he could inspect the roof and walls by the light of his candle. There was another flooded gallery on this level - again with a narrow path past. 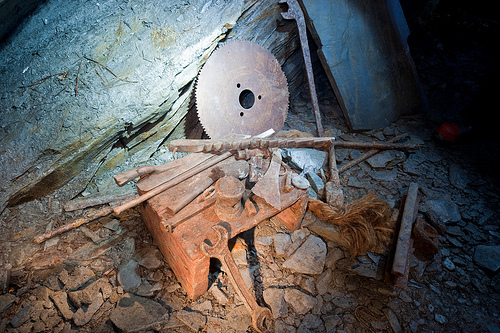 There are still quite a few tools and artifacts left - here are some collected together. A couple of oddities here - the notched stick is a slate measurer and the flat thing at the back is a trimming knife - both tools would normally only be used on the surface, so it's odd to find them down here. Back to the incline again - it's possibly confusing, but the incline slopes from lower left to upper right. 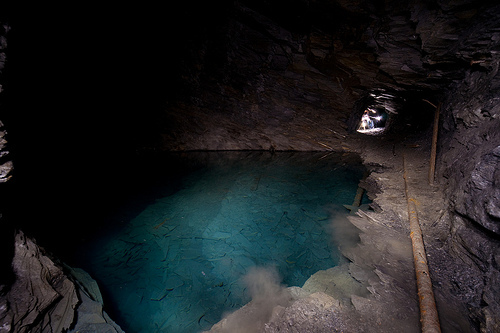 At this point is possibly where one of the two fatal accidents recorded for this mine occurred. 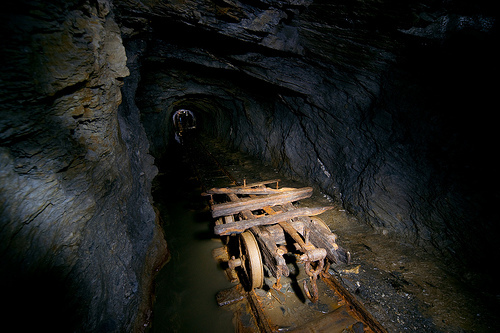 Simple electrical buzzers were used to control the incline wagons - a signal was misunderstood, and a wagon descended at speed, crushing a miner. 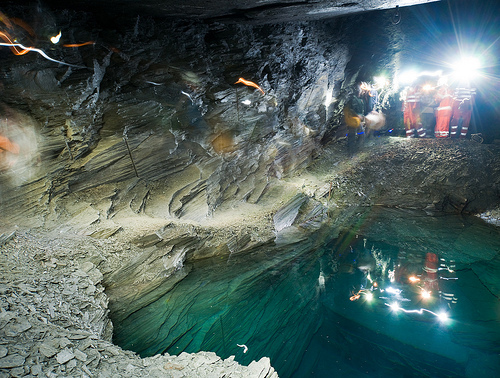 Just 'cos you asked, the other accident was on the surface when a snapped wire rope sliced a miner in half. Nice. 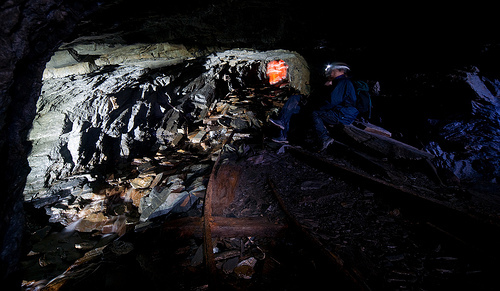 This mine was actually very safe by the standards of the industry, though - only two recorded fatalities in about 70 years of operation is not bad.